If one assumes, as most Egyptian scholars do, that individuals living in our generation are the smartest, most technologically advanced humans to have ever lived, that folks living back around 2,000 BCE were middle bronze age primitives, with no appreciable mathematical or technological skills, then those assumptions might lead us to conclusions which might more reflect our own biases than the actual thought processes of those who built structures like this one, viewed from the front. 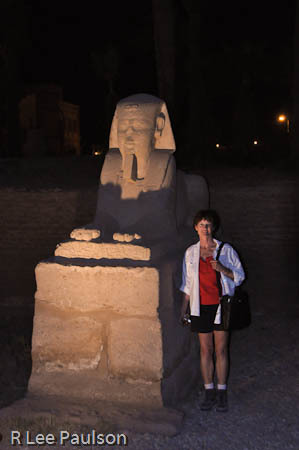 I'm told that back in antiquity this sphinx lined grand avenue continued several kilometers all the way to the Temple of Karnak. Notice the obelisk on the left side. 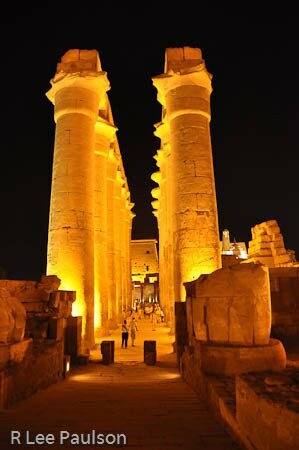 Originally, there were two obelisks in front of this temple, one on each side of the entrance. The missing mate is currently in Paris, courtesy of Napoleon. Thought you might like to see a close up of the carving on the obelisk and just how finely the hieroglyphs have been carved into it. Though some of the glyphs have been defaced, it's clear that whoever carved this was very highly skilled. Notice also how pleasing the proportions are. As with other sites I'd seen on this trip, I found myself immediately questioning the "middle stone age primitive" assumption with respect to the builders of this place. Each of these human headed lion sculptures that line the grand avenue is exactly identical to the others--and at one time there were hundreds of them. It would take a seriously sophisticated 'primitive' to make so many perfect copies. Here we are closer to the temple entrance and we see, if we look carefully, that designs seem to be carved into the temple walls. Here is a close up of the design showing the battle of Kadesh with the pharaoh Ramsis II leading a charge against enemies, who are falling under the wheels of his horses and chariot. 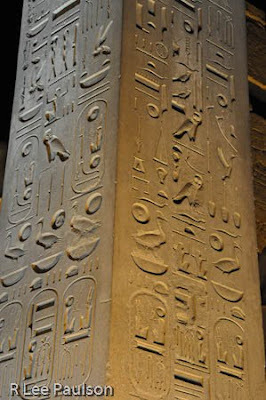 The Cliff Notes version of the long story told in hieroglyphs has Ramsis II, separated from his troops, single handedly killing many thousands of enemy soldiers. From a literal historical perspective, it was physically impossible for Ramsis to have single handedly killed that many enemy soldiers. 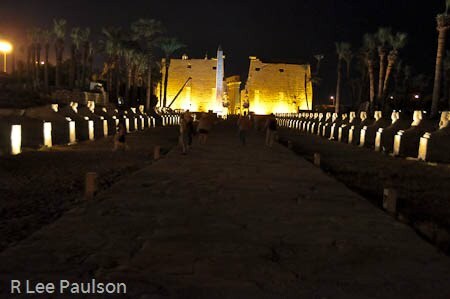 Not only that, but history shows the war continued on for another fifteen years, (so this battle was hardly an overwhelming victory) when Ramsis II eventually took the daughter of the defeated king as one of his wives. 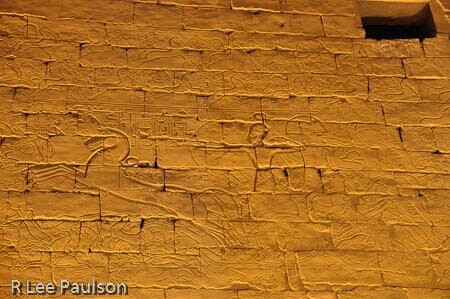 The question becomes, why would Ramsis II place such an obvious exaggeration of the Kadesh battle on the outside wall of his portion of this temple? 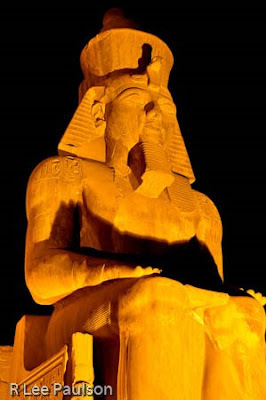 Given the 'primitive individuals' assumptions mentioned above, the common view held by scholars is to conclude that Ramsis II was a supreme egotist. For proof, one need only look at the size of those gigantic statues of himself he placed in this temple--and elsewhere. 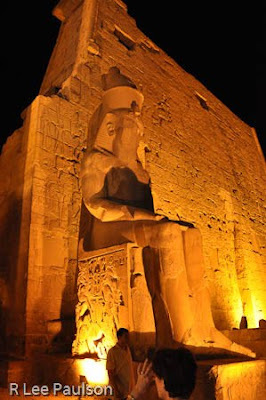 I'm willing to concede that Ramsis II could have been an out-sized ego maniac. However, based upon what I had seen so far on my trip, I found it easy to suspect that, where the ancients were concerned, it wasn't that simple. A French scholar, Schwaler de Lubicz studied this temple for fifteen years and came to the same conclusion. He produced a huge, two volume, work titled the Temple of Man in which he makes a very strong case that this entire temple is, in fact, a symbolic representation with a much more subtle meaning than current scholars are willing to admit. Obviously, Ramsis II was not the one who united upper and lower Egypt. That occurred long before he became pharaoh. But, according to Schwaller de Lubicz, as pharaoh, the king was a living symbol of divine man. His job was to reconcile opposing forces, both within himself, and in his country. It was his job to lead the way for everyman to do the same--unite the opposing forces within ourselves. If we go back and revisit the scene on the wall above, where Ramsis II single handedly slays thousands of enemy, Schwaller de Lubicz sees a very different interpretation than that Ramsis II was simply a self-aggrandizing ego maniac. Schwaller de Lubicz suggests that the scene was meant to show, in symbolic form, the pharaoh subduing the forces of chaos, if you will--within himself. And thereby shows us that doing so is possible for us. 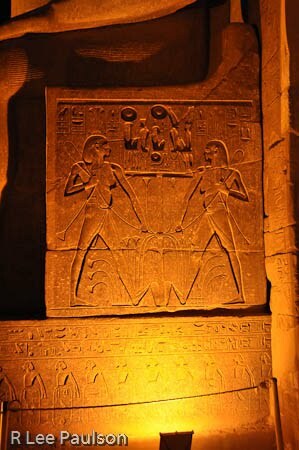 The bottom line of Schwaller de Lubicz's two volume work, the Temple of Man contends that the Luxor Temple, plan view shown above, one is the entrance, is really a symbolic representation of man, in all phases of his development. This was an astounding conclusion to draw, of course. Predictably, Schwaller de Lubicz has been roundly criticized or ignored by mainstream academics. I am standing at the entrance to hall number five in the diagram above, looking back toward the temple's entrance. Next time, more about what Schwaller de Lubicz found in this temple to support his conclusions. 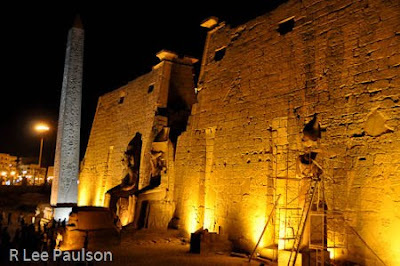 Continue on to Post 15: Luxor Temple II by clicking here.